The water surface mirrored the clear blue skies. A howling new born took his first dip in the holy waters. An urn strewn with marigold flowers floated on the undulating waves. And across the mighty river, flames from the pyres glowed, even as the morning rays kissed the holy Ganges. It was evident why the city had become a metaphor for life and death. On the ghats of Varanasi, in that moment, I was reminded of the geography lessons on evaporation, condensation and rainfall. A reminder of myriad forms taken by a river. Just like life, where nothing can ever become nothing. It merely changes form. After any personal loss, at some level, the thought of impermanence is comforting. Recently when I was in Lucknow, a cousin suggested we travel to Benaras for shopping. I wasn’t enthusiastic. I mean, who wants to travel to a crowded ancient city to shop? I was more accustomed to a ‘no-sweat shopping experience’ in the air-conditioned malls of Gurgaon. But when destiny wishes to take you some place, you can’t do very much, can you? After decades, the impromptu road trip took me to Benaras, my birth place. A lot had changed. The ancestral house was a pale shadow of its glorious days, palm trees in the garden were dead, city traffic had become worse and the Ganges had become murkier. The truism, ‘change is the only constant’ played itself in all its glory. The following day I was looking forward to feast on silk sarees, dress materials and some antique jewelry. Unfortunately, owing to a bandh called by some political outfit, most shops were closed for the day. Sigh! Ignoring the sane voices, “the city is tense, don’t go out,” we ventured out for some ‘forbidden fun’. We soaked in the languorous rhythm of a quiet city morning with the streets wearing a deserted look, except for a few hawkers and vendors. As for us, we had a lot to do. There was ‘bhang’ to taste, snake charmers to talk to, street food to savor and vendors to haggle with: it was day against which my Gurgaon routine registered as a disappointment. Strangely, for me, quite a few shackles were broken… I overcame my fear of creepy crawlies (Yes, I caressed a cobra. So what if it was defanged?). I overcame my inhibition to do crazy stuff and the reluctance to eat street food. How often had I repeated the cliché ‘Live like there is no tomorrow?’ And how often was I able to practice? Almost never. Somehow, something had always managed to dent the resolve - frenzied traffic, mercurial boss, petulant colleague, unreliable maid, past resentment or future anxiety. After a crazy day, the evening was reserved for a visit to the Kashi Vishwanath temple. We reached the temple, maneuvering our way through crowds and cows, trudging via narrow lanes. As a child, I had once witnessed the evening aarti holding my father’s hands. The memories were vivid but hazy. As the aarti commenced, hundreds of devotees jostled for a perfect view of the smiling idols adorned in bright silk and satin, embellished with brocade and jewels. 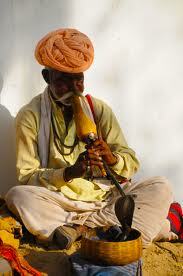 The fragrance from the sandalwood incense wafted around; strong yet pleasing. Enraptured people, consumed with desire, clapped and sang swaying to different rhythms. Eventually, the sound of the chants and chimes petered out. I stood there with folded hands - one amongst many. I had always prayed for health, family, comfort… believing that God is a tool to achieve these. I felt a wee bit culpable. The thought that I had always prayed for selfish reasons seemed repugnant. Yet in that incredibly beautiful moment, prayer for me was not about religion, aspirations, or demands. It was a thing in itself. Something which provided strength and peace. Strangely for me, the reluctant visit to the city of temples and ghats opened the mind to send and receive messages. A mind that always remains chaotic in the hum-drum of life. It made me see more than I had bargained for. Benaras came alive before my eyes, I could almost hear the prayer chants, feel the calmness descend. Evocative, poignant and beautifully crafted. This was an amazing read. Your comment means a lot. Thanks. I have never been there, but your post pretty much made me experience the historical city. But, isn't it so strange that while we are concerned about making religious places of worship grand and so attractive, we are neglecting God's creations of nature to an extent of extinction. Look at the state of the Ganges, or the absence of greenery in our cities becoming more and more evident. Being the city of temples and ghats, wouldn't Banaras be even more wonderful if people cared about the river just like they care about the temples ? True. They have spent crores and crores..enough to create a new river...but our rivers have become drains...Sad story of apathy. 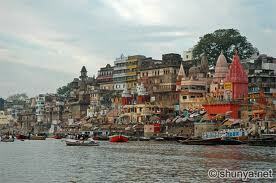 I want to visit Banaras once in my lifetime. Beautiful narration. All the best for the contest! Alka, it may sound cliche, but Benares is a state of mind. It is truly capable of giving you the 'Aha' moments of both extremes. Mind you, its my birth place too! I enjoyed the rich, tranquil language it was written in, almost transferring its quality to the river, the snake charmer and the cobra, and the Vishvanath temple. I know, but I couldnt narrate the Ohoo moments for a contest, could I.....ha ha. Very well told. Some experiences can not be understood unless felt by own self. Communication with God is one of those as well as feeling calm in serenity of a place. Never been to Benares, so it was an interesting read from you. All the best for the contest. I heard that it is really poorly managed in Maya's raj. Rachna...It is very crowded and filthy now...but I guess the city is all about your state of mind. 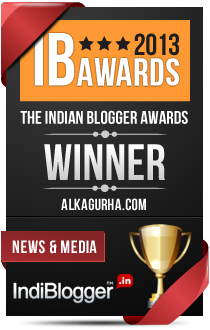 Alka, a beautifully crafted post and evoked the memories of walking in by lanes of Kashi Vishwanath temple, a dip in holy Ganga on Dashashvemedha ghat,Durga Mandir, feeding monkeys at Hanuman temple. I could go on....:) Wishing you the very best for the contest! PS: All these places strangely bring a direct communique with almighty when you close the eyes and sing Arti! Loved this post Alka!!! So refreshing after all the raving and ranting!!! How beautiful...reminds me of our Rishikesh trip when I was a kid. :) Havent been to Banaras as yet. Rishikesh is lovely too...Benaras has become overcrowded over the years. I bought those steamers every year :D Did you get one ? Really? your nani stayed there? Each time..I went to Vishwanath Gali for streamers and sweet supari. Go, with an open mind. the first reaction is "OMG it is sooo crowded." Banaras... the spiritual city :) I haven't been to the city though being living pretty close to it in Lucknow but have heard a lot about the godly city. And, you were reluctant to have the street food? That's much better than most of American style outlets. Believe me! Memories of Kendriya vidyalaya BHU campus came alive Alka!I have stayed in Varanasi and I loved it and hated it at the same time.You are right,ohoo moments are best forgotten.The Ganga,the temples and the myriad cultural hues is what makes the city unique.The azaan the Hanuman chalisa and the classical gharana singing ..there is so much to Varanasi really! Rachit...I have a sensitive tummy. Sharmila...My mom studied at BHU too. I am glad I revoked some nostalgia...Thank you for spending time here. SAP can be modified according to your needs and it has a wide scope of incorporating modifications in order to customize for one's specific requirements. :-) Yes, and westerners love the chaos there! It reminds them that the world has another pole too.